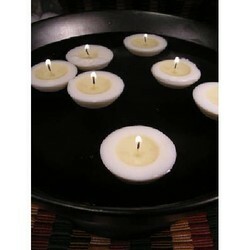 Leading Manufacturer of floating candle from New Delhi. We are a noteworthy organization devotedly engaged in offering a wide gamut of Floating Candle which is ideal for decoration purposes. The offered range is appreciated for its perfect finish, excellent design and trendy look. Before final dispatch, this watch is tested on various quality measures to ensure its flawlessness and quality. Additionally, we offer this range of watch in various designs, shapes and allied specifications to comprehend and meet the emerging requirements of clients.